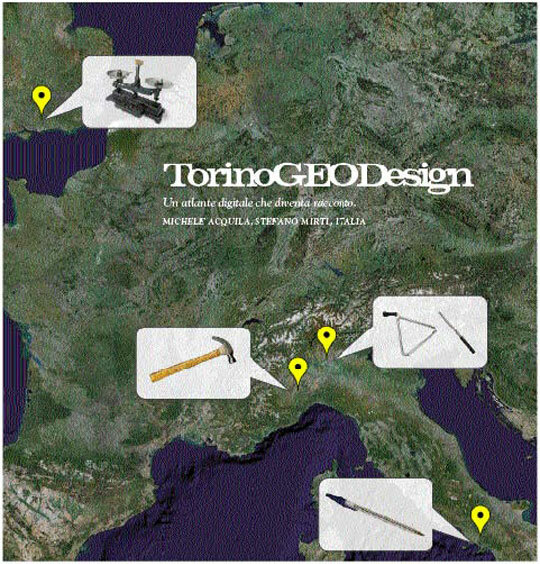 It is not easy to explain the Torino Geodesign project. It is a complex process which involves local administrations, a varied group of curators, communities, designers and companies. The first stage was mapping around fifty ‘practice communities’. This term applies to a group of people who gather out of necessity or desire. The rowers as the Romanians, who picnic in the park on Sundays, are “practice community”. Throughout various meetings (held last spring) the organisers worked with each community to identify a product or service they needed or wanted to have. The Albanian students wanted to produce a magazine, while capoeira fans wanted musical instruments to use in their sport/dance, and so on for all the groups. Each of the fifty communities came up with a clear, well (but not overly) defined project idea. Thanks to Abitare (media-partner of the entire event), in the summer of 2007 an international competition was launched to select the architects, designers and artists who would work with the communities: big name designers, talented unknowns, schools, groups, creatives from Piedmont and others from further afield. Lastly, for each theme (which at this point had a community working with a designer or group of designers), we found a company able to work on the idea in question. For instance: having established that the Circus School of Grugliasco wanted a portable tent for staging on the spot shows in public areas, Ico Migliore and Mara Servetto (two highly talented designers when it comes to temporary structures) began working with them. The company Ferrino (specialized in making tents) was contacted for prototyping and production. Imagine 48 of these triangles (community / company / designer), and a project workshop for each (on average a week spent working together), and you get a picture of Torino Geodesign. The workshops generated ideas, solutions, theories, sketches, models, prototypes… and in many cases reached the stage of producing a first limited edition product (or service). The first milestone was the big exhibition/festival held in the Palafuksas, in the heart of Porta Palazzo market in Turin, though in actual fact this was just the first step in a much more ambitious path set to continue (in Turin, and not only) in forthcoming months. These pages show a (scaled down, minimal) version of the project diary (created in digital form using the tools available on Google Maps), featuring the bodies involved, the people, the meetings and the parts that worked out, as well as all the slip-ups and mishaps. Those interested can check out how the work evolved in this complex system on torinogeodesign.net. A fresh way of looking at the world of design, and the design process. This experiment aimed to bring together the most interesting forces at work in a city like Turin, in the context of a discipline (design) which is undergoing a complete transformation. The first results have exceeded expectations, and perhaps it is still too early to say where the project will lead. 1. Turin, piazza Solferino, initial headquarters of Torino World Design Capital 2008. First meetings with Paola Zini and the TWDC08 organizing committee. First thoughts about creating an exhibition/event dedicated to an alternative way of looking at design. 2. Milan, via Cascia, Id-lab. Working between Turin and Milan, the general structure emerged: a triangle connecting local communities, designers and companies. 3. Turin, Piazza Palazzo di Citta’, City Hall. The Mayor Chiamparino gets interested in the project. He likes the idea of having designers working with different communities: so, if I’ve got it right, in the end we’ll have designers designing latrines for Porta Palazzo? 4. Milan, via Donizetti, studio Boeri. The project takes shape. The involvement of Stefano Boeri seems a natural, obvious step to all. 5. Turin, Piazza Palazzo di Citta’, City Hall. Paola Zini organizes a meeting between Chiamparino and Boeri: the two hit it off and the initiative gathers speed. 6. Turin, via Corte d’Appello, department of Integration Policy. Chiamparino refers us to Ilda Curti, Head of the department of Integration Policy. When political support begins working on various levels, everything gets stronger and more logical. 7. Naples, Vesuvius. Lucia Tozzi arrives from Naples: critic, intellectual and free thinker. The work group now involves Boeri + Stefano Mirti with Lucia Tozzi handling curatorial questions. Id-Lab is in charge of all logistics and organizational issues. 8. Porta Palazzo, offices of The Gate. We meet Luca Cianfriglia, the director. Another key player for the entire initiative. He works with a huge number of communities of foreigners who live and work in Turin. 9. From London, Hans Obrist and Rem Koolhaas take part in the work of the jury selecting from around 200 applicants. Around 100 are outstanding and completing the selection process is very tough. Naoto Fukasawa works in collaboration with Danese, with Turin’s community of Erasmus students. Erasmus student: living with others not by choice but necessity. Settings, objects, a world of necessary and possible solutions. Jasper Morrison worked with the Piazza Madama Cristina community in the San Salvario neighbourhood. The theme: how to use the market area when the market is not on. Are there other options apart from unauthorized parking? Sahar Madanat, designer of Jordanian origins based in San Francisco, in collaboration with Martini S.p.a., worked on designing utensils for the time-honoured Turkish baths in via Fiochetto. Design meets the world of spa treatments and steam. 4. Wei Weng + 3 Gatti, China. Designers from Shanghai get to work with Lucifero (company specialized in lighting) and the Peruvian community in Turin. The idea is to design, prototype and construct an object to convey the strong identity of the Peruvian community in Turin. The Turin architect, with the support of Azetagroup, worked with the community of residents in the council housing in via Parendo. The project looked easy (to design a clothes drying rack for closed balconies) but actually turned out to be very challenging. The result? Brilliant. The US designer got involved in the workshop with the Romanian community in Turin, coming up with design solutions for the headquarters of Fratia, the city’s main Romanian association. In other words, new horizons for the humble carpet. Sami Rintala accepted the challenge of working with the support of Azetagroup, to design a stall + cover for the vendors at the Balon market. Another seemingly simple project which required a complex response. 8. Bruce Sterling, San Francisco. The challenge that Bruce Sterling took on, together with ToShare, Odoardo Fioravanti and Radio Flash, was to come up with a radio format for Turin’s African community. Recipes, hairstyles, music and Nollywood films involving Turin’s African community…. 1. The Urban Cyclists’ Community. Luk is an anti-theft device built into road signs. Designed by Giulio Iacchetti in collaboration with Extravega and Turin’s urban cyclists’ community. 2. Circolo del Mossetto Bowling Ground. Coloured bronze bowls designed by Marti Guixe’ in collaboration with Saporiti Italia for the bowling community. So why coloured bowls? Simple! Because on television coloured bowls show up so much better. Turin’s Brazilian community wanted a Berimbau that would produce transcribable notes. The result of the workshop held by Vered Zaykovsky, with the collaboration of Civico13 and modelling studio Co.mo.r, was a non-traditional Berimbau made of fibreglass and carbon.